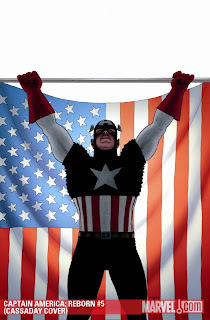 "Time for a new morning in America..."
Everything about writer Ed Brubaker's latest issue has 'classic' written all over it, figuratively not literally of course - that would just look crazy. Having mentally hijacked the body of Steve Rogers, the Red Skull uses his forces to ambush the pursuing Avengers, causing the Quinjet to crash land in the Reflecting Pool at the foot of the Washington Monument. As Steve's spirit brakes free of the 'mind cage' the Skull had him entrapped in, the bone-faced dictator is forced to split his energy between fighting a revived Rogers within his own consciousness, and battling against current Captain America; Bucky Barnes at the foot of the Lincoln Memorial. A symbolic setting with some pretty epic imagery to boot, ultimate pencil-smith Brian Hitch has really shifted into another gear altogether, for the penultimate issue of this top-selling mini-series. 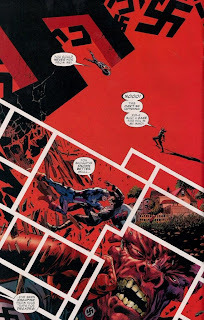 Aided by the amazing line work of inker Butch Guice, the duo's rendering and page layouts of a world ruled by the Third Reich is truly jaw-dropping stuff, the page where Steve 'breaks out' even more so. Then there's the Modoks... yip that's right plural. 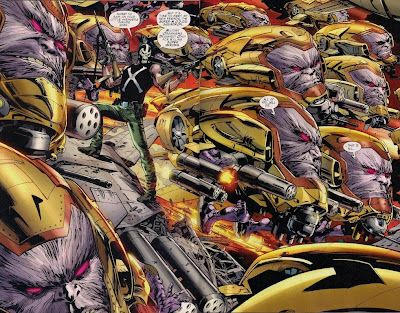 While Marvel's main floating head in a chair has always being pretty funky, as Crossbones leads the Super-M.O.D.O.K Squadron into battle on a double-page spread, you suddenly realise just how killer the concept can be. 'Military Organisms Designed Only for Killing super-heroes', the Red Skull's daughter 'Sin' finally being put in her place, and the second comic character in as many weeks to lose his hand, means even with the ending given away and one more issue to go, this series has already earned it's stripes, as a 'must have' for any comic fan.